Start off your visit on the 18th (Thu): take in the exciting artwork at Minima Gallery, get a taste of the local shopping with Dio Horia, and then take a stroll through Little Venice. 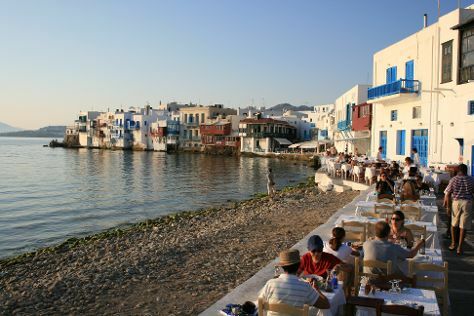 To find traveler tips, photos, other places to visit, and tourist information, use the Mykonos Town journey builder . Zurich, Switzerland to Mykonos Town is an approximately 3.5-hour flight. You can also do a combination of train, bus, and ferry; or do a combination of car and ferry. Due to the time zone difference, you'll lose 1 hour traveling from Zurich to Mykonos Town. Prepare for a bit warmer weather when traveling from Zurich in April: high temperatures in Mykonos Town hover around 22°C and lows are around 16°C. Wrap up your sightseeing on the 18th (Thu) early enough to ride a ferry to Fira. 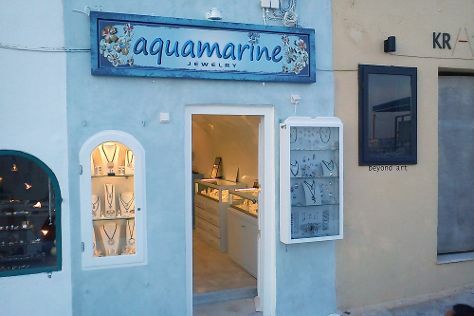 Start off your visit on the 19th (Fri): stop by Aquamarine Jewelry, kick back and relax at Red Beach, then delve into the distant past at Akrotiri, then get a taste of the local shopping with MATI Art Gallery, and finally take in the exciting artwork at Tzamia - Krystalla Art Gallery Santorini. Here are some ideas for day two: kick back and relax at KAMARA BEACH, shop like a local with Eduart Gjopalaj, then take in the exciting artwork at Art Space, and finally shop like a local with S.M.A.G Spira Marble Art Gallery. For more things to do, photos, maps, and more tourist information, read our Fira online tour planner . Getting from Mykonos Town to Fira by ferry takes about 2.5 hours. Other options: fly. In April, daily temperatures in Fira can reach 23°C, while at night they dip to 15°C. Wrap up your sightseeing on the 20th (Sat) early enough to travel to Athens. Kick off your visit on the 21st (Sun): wander the streets of Ermou Street, look for gifts at Ermou Spirits Cava Pittaras Trade Beverages, then contemplate the long history of Acropolis of Athens, and finally take an in-depth tour of Acropolis Museum. For reviews, traveler tips, photos, and other tourist information, refer to the Athens day trip planner. You can fly from Fira to Athens in 3.5 hours. Other options are to ride a ferry; or do a combination of ferry, taxi, and flight. April in Athens sees daily highs of 24°C and lows of 15°C at night. Wrap up your sightseeing on the 21st (Sun) early enough to travel back home.